The estimated damage caused by the last weekend’s protests held by “yellow vests” in French capital Paris against fuel taxes was €3-4 million ($3.4-4.5 million), local media reported on Monday. Thousands of "yellow vest" protesters had gathered in Paris and several other cities to protest French President Emmanuel Macron's controversial fuel tax. Demonstrators, who generally live in rural areas due to high rents in the cities, called on Macron to cut fuel taxes and make economic arrangements to ease their lives. 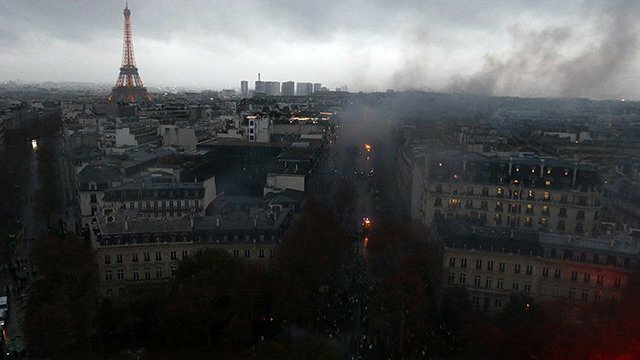 French police on Saturday cracked down on protesters around the famous Champs-Elysees in Paris with tear gas and water cannons. In the riots, at least two people have been killed, while 1,043 others -- including 222 security forces -- were injured, and as many as 1,424 persons were arrested. According to a recent survey, 84 percent of French people -- mostly from the middle-income group -- support the protests. Over the last year, fuel prices in France have risen more than 20 percent. Meanwhile, Macron has postponed his visit to Serbia over the "yellow vests" riots in France, Serbian President Aleksandar Vucic announced on Monday. Macron was expected to go to Serbia on Dec. 5 but he postponed his visit to the Balkan country. In a news conference, Vucic said Macron told him over the phone that he has postponed his visit to Belgrade over the ongoing fuel tax protests in France.